This weeks anime is Hakkenden: Eight Dogs of the East. This is a hard anime to explain as I am only half way through the season. The basis of the plot is that there was this village that got hit with a plague and was burned down. Only 3 survived this incident but with a price. Each has a spirit in them that gives them special powers, or abilities. 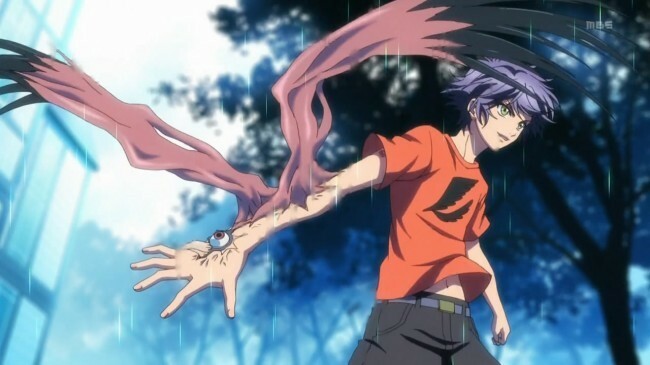 Shino the main character possesses Murasame the Demon Blade. Something that others are seeking to find and control for themselves. The price of this possession is that he can never grow old, and is trapped in a childs body. Later they come into contact with Satomi Rio who possesses a fox spirit and Shino recognizes him as the one that gave him Murasame. Satomi tells Shino that he is the holder of one of these mystic beads and is tasked with finding the other 7 and their owners. The art style in this anime is vibrant and full of color. You can tell its a more modern anime. The characters each have their own history and special power or spirt that you learn about. What got me first was I saw a pic of the lead character and his sword and thought hey this might be cool to check out. Once watching it turned out to be something totally different than I thought it was but in this case is a good thing. While I thought it was just going to be some Samari type of anime it turned out to be something totally different. The spirits and demons in the anime are interesting and made me stay tuned to learn more. There is something that is bothersome and thats just because thats not my thing. The show has some homosexual undertones. Nothing too gross or over the top, but just boys dressing as girls, and lots of male on male eye contact and hovering. Ehh if you can get past that its actually a pretty good anime.